Kameki and Nobu Tsuchiura worked with Frank Lloyd Wright from 1922 to 1925 in Los Angeles and Wisconsin, before returning to Japan and starting their own successful practice. 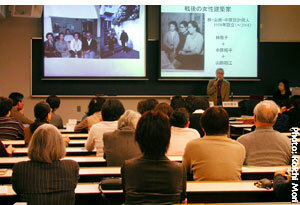 Their lives and architecture were discussed in detail by speakers Nobuko Ogawa, an architect and professor emeritus of Japan Women's University, and Atusko Tanaka, an architect and architectural historian. The women are coauthors of the groundbreaking study of Nobu Tsuchiura, Big Little Nobu. Ogawa, one of Japan's first women graduates in Architecture after WWII, worked for Kameki Tsuchiura Architects and Associates from 1953-1956. She is a specialist in Swedish architecture and a founding trustee of WAAJ. She currently serves as the chair of UIFA Japan. Tanaka, who studied with leading Wright scholar Kathryn Smith, conducted wide-ranging interviews with the Tsuchiuras in the late 1980s and has written extensively on their careers and work.